Tamar Braxton is an American singer who is most famous for being the sister of Toni Braxton as well as a part of the sibling R&B singing group, The Braxtons. Tamar, who did not enjoy huge success in a solo singing career, has gone on to act as well as star in her own reality television series while also becoming a tv personality. She is a former co-host of The Real talk show and has even ventured into business, launching Tamar Collection, a ready-to-wear clothing, and shoe line. Tamar Braxton was born Tamar Estine Braxton on March 17, 1977, as the youngest of six children to Evelyn Jackson and Micheal Conrad Braxton Sr. in Severn, Maryland, United States. Her father was a pastor in their local church but also worked in a power company while her mother was an amateur opera singer and cosmetologist. Tamar and her siblings; Toni, Michael Jr., Traci, Towanda, and Trina were all raised in a strict religious household. She started singing as a toddler, following in her mother and sisters’ footsteps. Also, like her sisters, she joined the choir of her local church where her father ministered. It was there that the Braxton girls began to gain popularity and started to perform together as The Braxtons. In 1989, they were collectively signed to Arista Records, releasing their first single titled ‘Good Life’ a year later. The song was a commercial failure and led to them being dropped. It, however, helped in launching her older sister, Toni’s career. Tamar became a backup singer for her sister and appeared alongside her in music videos. In 1996, Atlantic Records offered the group, which this time did not include Toni and Traci, a record deal. That year they released the album ‘So Many Ways’ which featured the single of the same name. The album did better than their first collaborative project, peaking at No. 26 on the Billboard R&B/Hip-Hop Albums chart. A world tour with Toni Braxton where they served as opening acts followed before the group disbanded after Tamar opted to pursue a solo career. Tamar Braxton released a self-titled album in 2000 after signing on to join DreamWorks Records that same year. The album featured production work from Missy Elliot and Jermaine Dupri but still failed to receive radio play which led to her being dropped. She unsuccessfully tried to release another album in 2004 after signing on to Casablanca Records. Only two singles were released to the public. After a six-year hiatus, Tamar’s music was included on the ‘Adidas 2: The Music Compilation’. That same year she reunited with her sisters and mother for a reality television series on WEtv titled ‘Braxton Family Values’. The success of the reality series led to a spin-off series with her and her husband which focused on their married life and her solo career. Tamar Braxton was becoming somewhat of a star on reality TV as she began to gain a following. In 2013, she secured a record deal from Epic Records and officially released her second album titled ‘Love and War’. The album hit the shelves on September 3, 2013, and sold 114,000 copies in the first week. Its singles featured on top of the charts, with the title track itself peaking at No 1 on the Adult R&B Songs chart and staying there for nine weeks. That same year, she was employed to co-host ‘The Real’ talk show on the Fox Broadcasting Company. She lasted on the show for three years before she was fired on May 22, 2016. Tamar Braxton’s net worth is said to be around $7 million. This figure was calculated through her earnings as a television personality, singer, reality tv show actress as well as her other business ventures which include a shoe and clothing line. Tamar Braxton has been married twice. Her first marriage was to music producer Darrell “Delite” Allamby. The marriage lasted for two years. In 2013, the same year she divorced her husband, Tamar began seeing another music producer and record executive, Vincent Herbert. The couple dated for five years before exchanging vows in 2008. 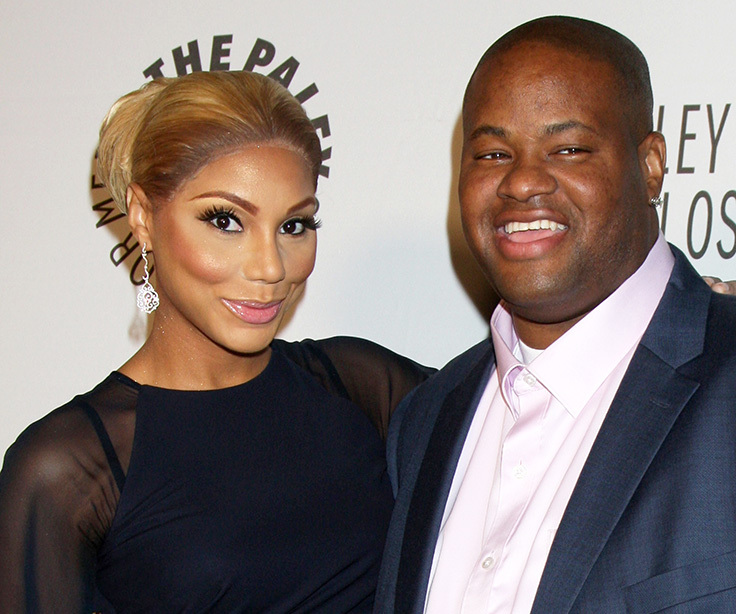 In June 2013, the couple was blessed with a son which they named Logan Vincent Herbert. Recent reports have indicated that the marriage might be on the rocks with one particular report saying Braxton filed for divorce from Herbert in October 2017, citing “irreconcilable differences”. But the report is not yet confirmed so we have reasons to believe they are still together.